Zucchini Bread… What’s better than zucchini bread? 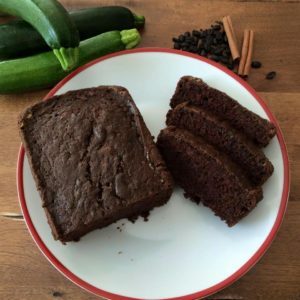 Chocolate zucchini bread! This is a rich, moist, quick bread with a tender crumb. Great with a cup of coffee, as a dessert or even breakfast! The recipe is made with cocoa powder, rather than chocolate chips. Use the larger grate on your hand grater, or use a food processor with a grating attachment. This recipe doubles easily for 2 loaves. Step 1: Place the grated zucchini in a sieve over a bowl to drain, while you work on prepping the other ingredients and preparing the recipe. Step 2: Preheat oven to 350°F, place on middle rack. Grease a 9×5-inch loaf pan with softened butter. Step 3: In a large bowl whisk together the flour, unsweetened cocoa, baking soda, salt, and cinnamon. Whisk until there are no more clumps. butter, coffee, vanilla and almond extract and beat until smooth. Step 5: Add the shredded zucchini into the sugar /egg mixture; then add the dry mixture to the zucchini mixture in 3 additions, stirring to combine after each addition. Step 6: Work quickly, and place the batter in the loaf pan. (Work quickly because once the dry ingredients have mixed with the wet, the leavening has begun.) Place into the oven. Bake for 50- 55 minutes at 350°F, or until a skewer inserted into the center comes out clean and easily. (My loaf took 57 minutes to bake.) Remove to a rack. Let cool slightly in the pan for 5 minutes, then run a butter knife around the edges to separate the bread from the pan. Remove from the loaf pans and let cool completely on a rack. Sprinkle with flaky sea salt and serve. Make sure the loaf has completely cooled before slicing with a bread knife.